Formulas of Problems on Mixture and Alligation - Aptitude Questions and Answers. 1. Mixture: Aggregate of two or more than two type of quantities gives us a mixture. 2. Alligation: It is a method of solving arithmetic problems related to mixtures of ingredients. 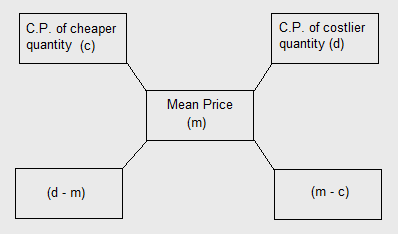 This rule enables us to find the ratio in which two or more ingredients at the given price must be mixed to produce a mixture of desired price. Thus, (Cheaper quantity) : (Dearer quantity) = (d - m) : (m - c). 4. Let a container contains x units of liquid from which y units are taken out and replaced by water.